Yesterday, at church, the pastor talked about a godly perspective on money. We often worry about money, and we also often spend too much on things we do not need. If we would follow God’s instructions and fearlessly give in tithe and to others, we surely would have more than we ever imagined. Fear, however, often gets in the way. 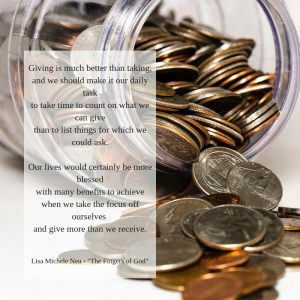 Fear of not having enough, fear of not being able to pay the bills, fear of being penniless and not having enough for food and housing … all of which often makes us reluctant to give. Check out my poem entitled “Giving” in it’s entirety in my book, “The Fingers of God,” available online through Amazon and Barnes & Noble.